Turtle Tail is for any large group that wants it all. The activities you can do are limitless inside and out, between the on-site gym, tennis courts, game room, home theater, and water sports equipment. The wrap-around infinity pool and the Jacuzzi are guest favorites, and the villa comes staffed with a personal chef, butler, and housekeeping. Everyone and everything is taken care of at Turtle Tail, with total luxury and elegant design. 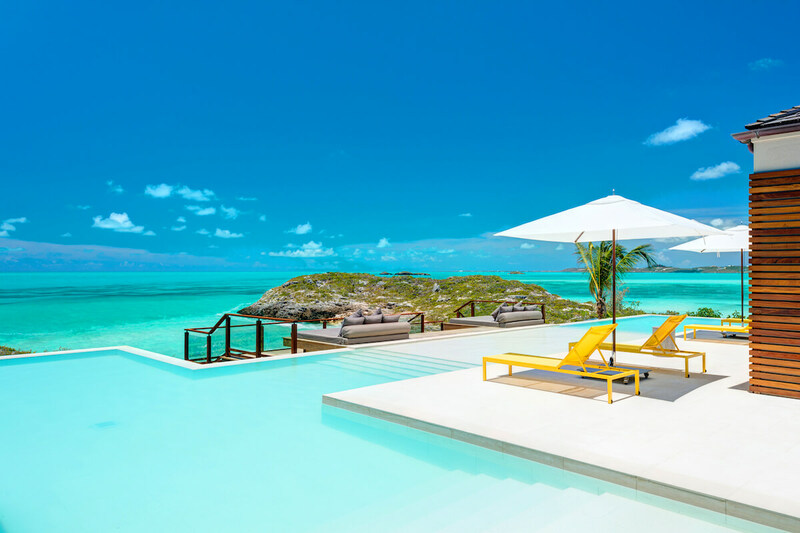 Turtle Tail Estate is nestled into a private cove on the south side of Providenciales, secluded yet not far from shopping, restaurants and other island activities. A full staff compliments the five-star amenities here and no detail has been overlooked. Take a dip in the heated pool and gaze out at the sea, soak in the hot tub, or play tennis on the villa’s private courts. Guests can lay out on the sunny yellow loungers, snooze in the plush daybeds and hammocks, or read in the shaded armchairs. On-site water sports equipment, from a Hobie Cat to kayaks, allows vacationers to spend all day on the waves, and everyone can use the pool shower before roasting s’mores around the fire pit. Dine al fresco on a feast prepared by the staff in the fully-equipped kitchen or BBQ grill. For air-conditioned entertainment, guests can challenge one another to a round of pool, air hockey, foosball, ping pong, or darts in the game room. Turtle Tail’s state-of-the-art fitness center has cardio equipment, resistance machines, weights, a boxing station, and yoga mats, so anyone can keep up their workout routine on vacation. To top off the entertainment area, there’s a home theater with a projector screen and comfortable furnishings so guests can watch their favorite films with ease. The Great Room’s formal dining and entertaining space is accented with a unique wood-paneled ceiling, modern decor, and artfully crafted furnishings and light fixtures. Retractable glass doors leading to the terrace take up an entire wall, so guests can sink into the plush couch and stare at the sea. The gourmet kitchen has a rustic wooden table, a breakfast bar, and a sectional, so guests can enjoy casual or formal meals. A private chef will prepare three meals a day, so guests never have to step foot in the kitchen. Each of the seven bedrooms has an ensuite bathroom, TV, and king-sized bed. The main house’s five luxurious bedrooms each have a private terrace, fridge, walk-in closet, and ocean view. Four of the ensuite bathrooms have soaking tubs and rain showers, and all five have dual vanities. One bedroom can be converted into a twin suite. The two bedrooms in the guest house are best suited for staff, and share a Jack & Jill bathroom. Turtle Tail is just 5 miles from Turtle Cove Marina, and is even closer to the Turks and Caicos Tennis Club. It has direct access to Turtle Tail Beach, which has shallow water and scenic coves. Upon arrival guests will be greeted by a member of the villa management team and transferred to the villa. There is a $5000 food deposit (up front payment for initial food purchases). Car rental, grocery and beverage shopping (pre-arrival and during your stay), liquor and wine delivery, nanny service, baby equipment, spa services, yoga and personal training, and photography can be arranged for an additional fee.